Here's a preview from the musical I'm writing. The song "What Could Have Been" opens the story with a different angle from previous versions of the Arthurian legend. Morgaine, High Priestess of Avalon, has found her son and the lover of her youth, (Mordred and Arthur) both dead at the end of a battle. Her passionate song ends with a commitment to finding a way to rebirth Camelot. It turns out that the souls who had built Camelot are all committed to creating a new Camelot at a later date, which happens to be NOW! The song "NOW" finds Molly in her New York studio apartment reading a book about coming into alignment with her inner being and soul purpose through being present with her breath. 11:11 Preview of new CD - A Track for Thanksgiving! I first heard about 11:11 in 1991 through Erik Berglund, who introduced me to Solara http://www.nvisible.com/ who organized and facilitated the 11:11 planetary activation in 1992. I have often found myself looking at a digital clock and seeing 11:11, and I�ve enjoyed resonating with the inner light and love within all the world whenever I see this symbol. Several synchronicities have led me to record this set of musical meditations for experiencing the 11:11 vibrations on a deeper level. On 11/11, 2006 I performed at an 11:11 event in Asheville, NC and then the following June I met Zera Starchild who invited me to create music for an 11:11 gift basket she is marketing. So during the summer of 2007 at 11:11 am and pm Eastern Standard Time, I would sit at the piano, ask for music for the highest good with regard to 11:11, and then play and record the music I heard in response. Then I was invited to play for a meditation and healing session at the United Research Light Center, in Black Mountain, NC, where I often perform, on 11/11/2007. The music just happened to be professionally recorded that day, and I was gifted with a CD of what I had played. After hearing that music and starting the process of producing the finished CD, I went to a theatre performance. The box office attendent gave me seat 11 in the 11th row! That was way - more confirmation than I expected! The following track is one I'm considering for the album, and it seems to have a feeling of gratitude... a perfect complement for Thanksgiving! CD Release party for Kaleo Wheeler's "Ulana, the Way of the Heart"
Music of Peace Concert at Crystal Visions as part of their Celebrate the Season with Gratitude day. May the blessings of Gratitude be with you on this Thanksgiving! 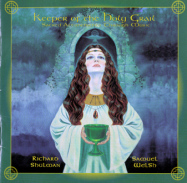 Here's a track from "Keeper of the Holy Grail" to accompany any thoughts of gratitude you may wish to enhance.